Troy Terry scored the shootout winner as the U.S. beat Canada 5-4 at Montreal's Bell Centre on Thursday to capture the gold medal. Canada came so close to world junior championship gold that, after losing in a shootout, it was an effort for defenceman Thomas Chabot just to talk about it. "It's hard for me right now," Canada's star rearguard said after the United States won a spectacular, back-and-fourth final 5-4 when Troy Terry scored the only goal in a shootout. "I lost one of the biggest games of my life." 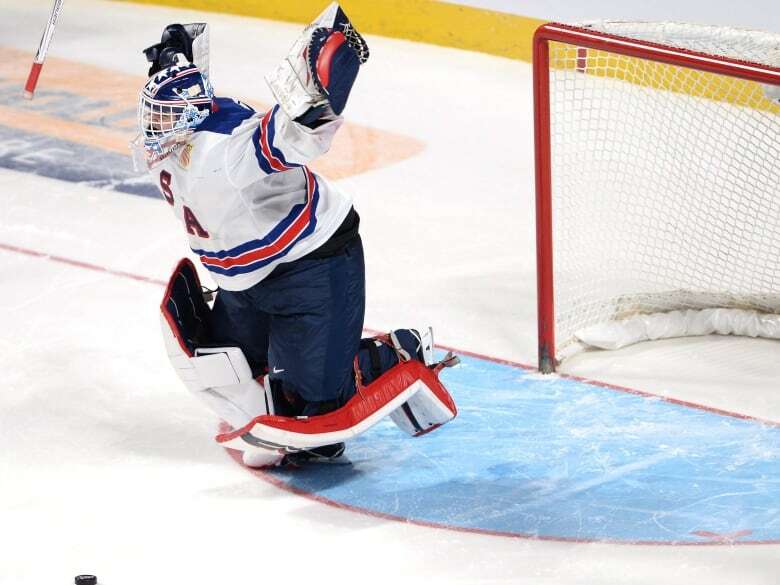 Canada wasted a pair of two-goal leads in regulation time and outshot the Americans 17-7 in a wild 20-minute overtime, only to be thwarted time and again by U.S. goaltender Tyler Parsons. Then Parsons stoned all five Canadians in the shootout while Terry beat Carter Hart between the pads to give the Americans their fourth world junior title. "I would rather it kept going," said Chabot, who was named tournament MVP despite the loss. "We had so many chances in the overtime and to go into a shootout, well, it's not something you can control. "Obviously I'd have liked to play another period, but that's how hockey is. We have to give credit to them. They found the back of the net in a shootout and that's it." There has been concern over low attendance at games in Montreal since the tournament started on Dec. 26, but for a Canada-U.S. final, there were 20,173 fans at the Bell Centre, nearly all of them roaring for Canada. Chabot and Jeremy Lauzon gave Canada the early 2-0 lead only to see Charie McAvoy and Kieffer Bellows tie it in the second. Nicolas Roy and Mathieu Joseph put Canada up 4-2 early in the third, but Bellows scored again and Colin White tied it at 7:07 of the third to help send the game into an extra period. "It was pretty awesome," said Lauzon. "Sometimes the crowd was so loud I couldn't talk to my partner right beside me. Chabot, an Ottawa Senators prospect, logged 43 minutes 53 seconds of ice time over four periods. "As a coach, as a staff, we wanted our players to give everything they had and buy into this team concept," said Canada coach Dominque Ducharme. "The guys went all out. "We're disappointed for our guys. They deserved to be rewarded." The U.S. and Canada have faced each other four times in world junior finals, with Canada taking the first in 1997 and the Americans winning the next three — including 2004 and 2010. Canada fell short of winning a 17th title and of repeating their victory when the event was also held in Montreal and Toronto two years ago. It was only fitting that Terry got the winner. He had three shootout goals in the semifinal against Russia on Wednesday that put the Americans into the final. "He's unbelievable," said U.S. forward Clayton Keller. "He's my roommate here. "He's a guy that doesn't get nervous. He just has ice in his veins and he came up clutch for us again." Canada outshot the Americans 31-28 and 50-36 overall. Matt Barzal's pass on a three-man rush went off Joseph's stick to Chabot on the left side for a shot into an open net 4:38 into the game. A long stretch of Canadian pressure led to Lauzon's goal at 9:02 as Adam Fox batted the puck into the slot with his hand and the Rouyn-Noranda Huskies defenceman fired it to the top corner past Parsons. The Americans bounced back to start the second as Canada left the centre of its zone wide open for McAvoy to cruise in, take a pass from Jordan Greenway and beat Hart glove side from the slot. A too many men on the ice call against Canada allowed the U.S. to tie it at 9:30 as Bellows tipped a Fox point shot under the crossbar. Bellows was sent off for kneeing Joseph 55 seconds into the third frame and Roy walked in on the left side and wired a high shot past Parsons at 1:52. Joseph went briefly for treatment, but returned to take Michael McLeod's pass up the middle and score his first of the tournament on a breakaway at 4:05. The Americans struck back 39 seconds later as Bellows one-timed a McAvoy pass from the right side and White evened the score at 7:07 when he redirected a Fox pass at the side of the net past Hart. Pierre-Luc Dubois wasted a glorious chance when he whiffed on a pass at the doorstep on a power play, a miss that could have given the third overall pick in the 2016 NHL draft the tournament-winning goal. "We're proud of our guys," said Ducharme. "They put so much effort into this. Not being rewarded is disappointing."